Irish Immigrants to America.. Heading Back Home? In all my years researching my Irish ancestors who had settled in New Haven, Connecticut, I had come across a hand full of records which indicated that an individual or a family probably returned to the place of their birth. I didn’t think about it too much and always assumed that it was not too common. Recently, while putting together a book on my Wrynn family, I came across such a record. It was a Civil War Draft record for “Michael Rinn” who lived in New Haven and in the draft record is listed as having “gone to Ireland”. This record, coupled with the fact that Michael is not listed in Connecticut records from about that same time, made me think that he and his family probably did return to County Leitrim. This week, while searching for newspaper articles for the Wrynn family, I came across a couple of articles from the 1850’s that made me realize that giving up the dream of a new life in America was not as uncommon as I had first thought. The first article that I came across was this one dated 9 September 1854 that seems to have been originally printed in a Boston paper and reprinted in the Columbian Register in New Haven, CT. I also found this article from the Columbian Register in New Haven, dated 10 March 1855. 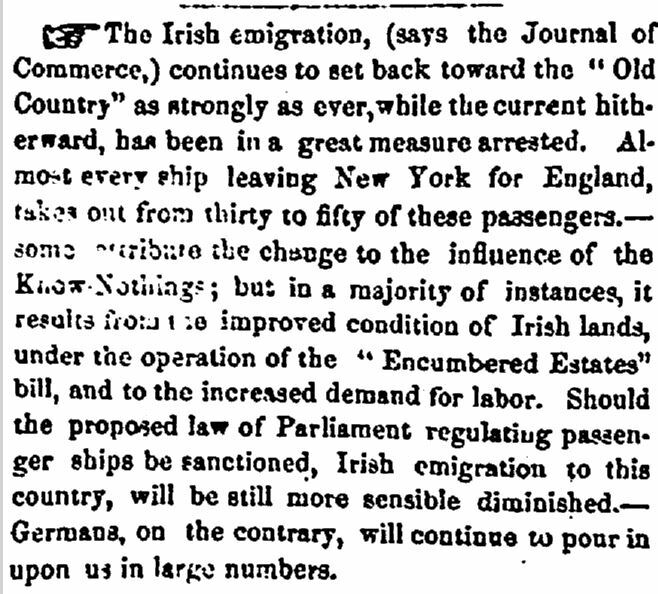 I’m not sure what the actual number or percentage is of Irish immigrants to America returning to the homeland, but I now know that it was much more common than I had originally believed.